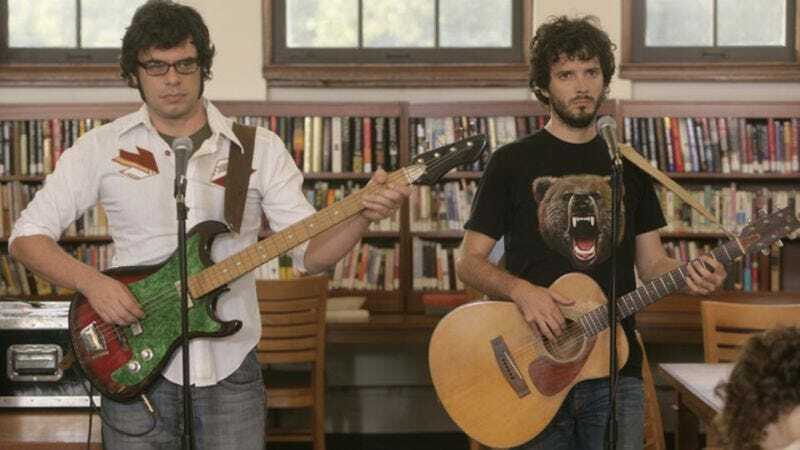 It’s been six years since Flight Of The Conchords went off the air on HBO, taking with it a lot of songs about awkward man-children and their surprisingly deft and catchy melodies. In the meantime, the child-men in question have kept busy, with Bret McKenzie traipsing around Middle-Earth and winning an Oscar for his work on The Muppets, and Jemaine Clement continuing to work as an actor and occasional writer, recently releasing the popularly received What We Do In The Shadows. Back in January, though, Clement hinted that the duo might reunite for a live tour, telling The Hollywood Reporter that they’d do it “later on in the year in the States.” At the time, Clement was promoting his new movie, People Places Things, at Sundance; he’s now doing the press junket for the movie’s wider release, and he’s dropped some hints that there might be even more Conchords coming in the near or distant future. When asked by Indiewire about whether he expects to spend the rest of his life being asked about the possibility of a Flight Of The Conchords feature film, Clement—who recently reunited with HBO for a new anthology comedy series with Judd Apatow and his Shadows colleague Taika Waititi—responded by saying, “We have actually started writing one,” before immediately lowering expectations as quickly as humanly possible: “But who knows if it will ever be made, we’ve written some notes for some different film ideas. We’re not down to the stage where we’re going, ‘The film is going to be like this,‘ it could be this, this, this, this, this.’” It remains to be seen what “that, that, that, that, or that” might entail, but it should be enough to let fans keep a very Conchords-like level of optimistic delusion going for at least a little while longer.